He's no beauty, but he sure does taste good! Never known for their grace or beauty, wild turkeys can be counted on to be good for supper. Having lived in areas of Pennsylvania where wild turkeys have always been abundant, I was somewhat surprised to read that our turkey population was ever endangered, yet today I find it’s true. Turkeys were abundant throughout North America when the settlers arrived, and soon became an important food source for the colonists. During the 1800’s, deforestation combined with unrestricted hunting decimated wild turkey populations. The Game Commission, by operating a successful trap and transfer program, imposing restrictions on hunting and even maintaining a turkey farm has been very successful in restoring our turkey populations. The turkeys did their part by becoming very adaptive and claiming as home some pretty unlikely habitats. Today in Pittsburgh’s heavily populated suburban neighborhoods, we don’t think twice about turkeys running through our yards and crossing the roads. Even watching a turkey’s awkward attempts to fly is pretty commonplace. But still, the daily life of a turkey remains somewhat of a mystery to me. 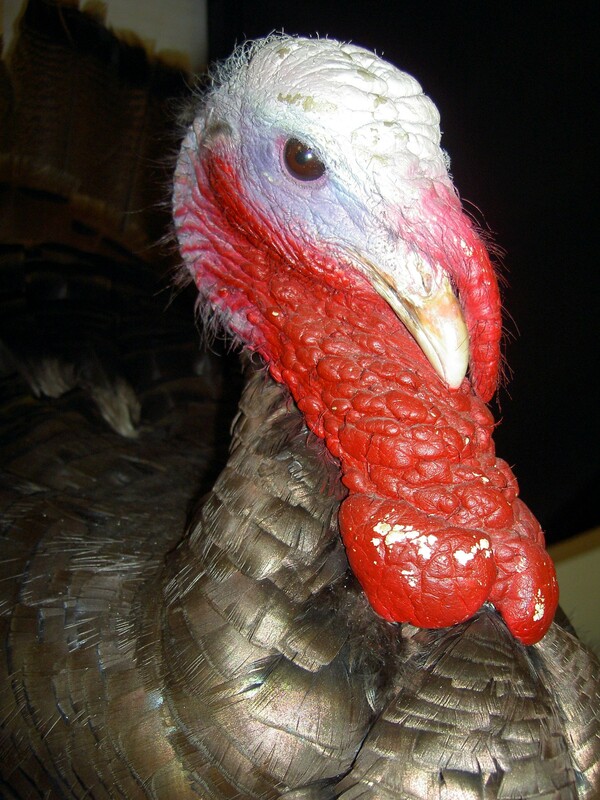 This article, while 10 years old, is still an interesting read about our local wild gobblers. 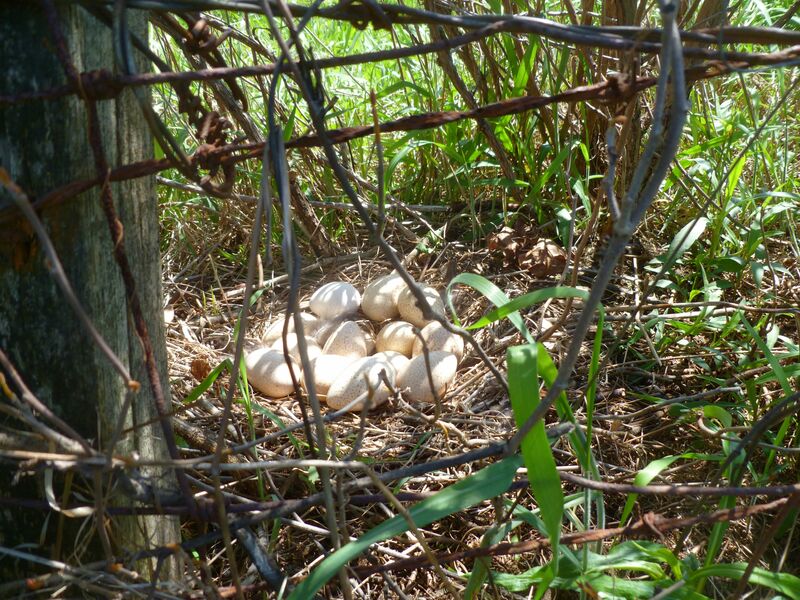 Rare to see: I found a hen sitting on this nest of wild turkey eggs on the farm. Not sure who was more startled, the turkey or me! My cousin has over the years become an excellent cook with the natural progression being a freshly developed interest in good ingredients and sustainable living. Part of this journey for him has involved exploring alternatives to our industrial meat system. His strategy for making improved choices includes his decision to become a hunter and harvest his own meat, along with splitting a side of pastured beef raised by a local farmer with a few friends. This spring, he bagged his first turkey – a jake (young male) and for my sausage making needs, he kindly shared a breast and a thigh. 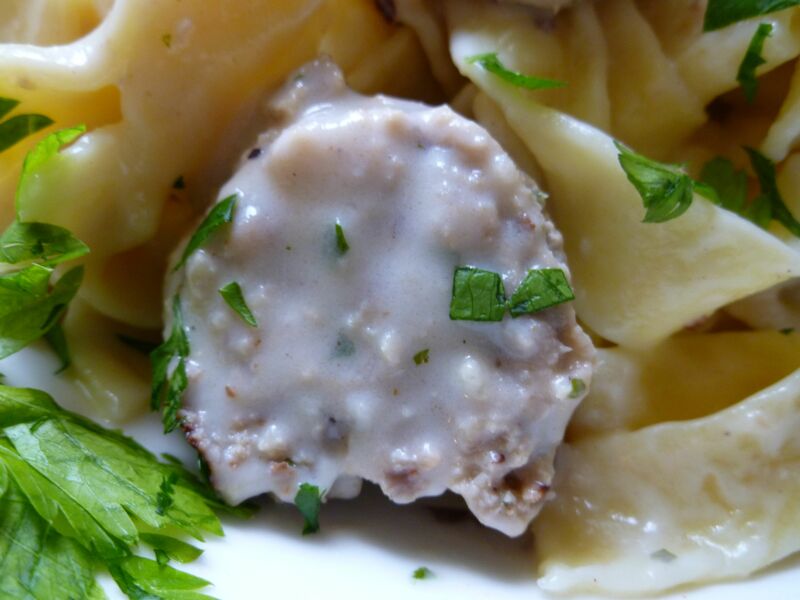 My inspiration for turkey sausage is this recipe for Turkey Meatball (Polpette alla Mollie) from Oprah.com. The recipe was created by Chef Mollie of Trattoria Mollie in California and makes ground turkey (which let’s be honest, can be a bit bland) rich and delish. Because half of my eaters don’t like spicy food, I didn’t use the crushed red pepper and I like it almost as well. Resting meat mixture awaits a good food processor grinding. 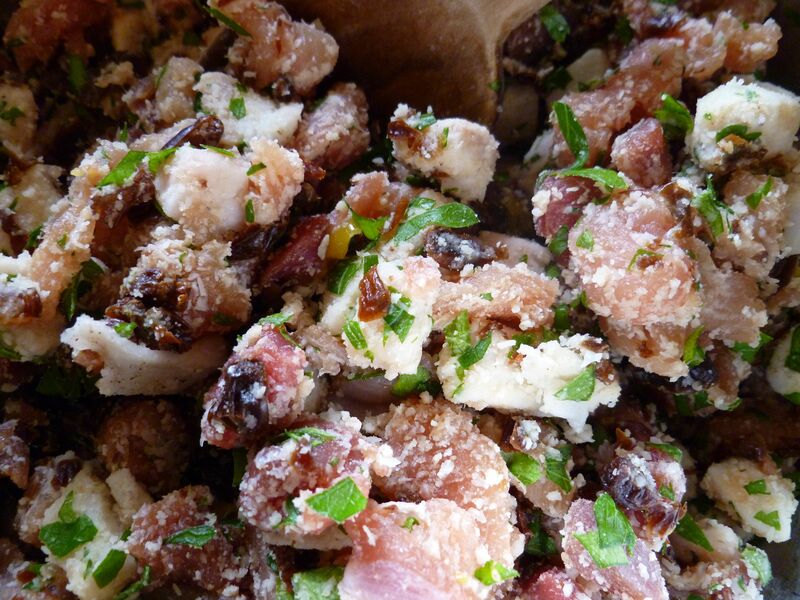 I mixed my cubed turkey with some pork fat, grated pecorino, chopped plumped black raisins and fresh, chopped Italian parsley from our garden and put it in the fridge for the flavors to marry. Check out the mixture here. 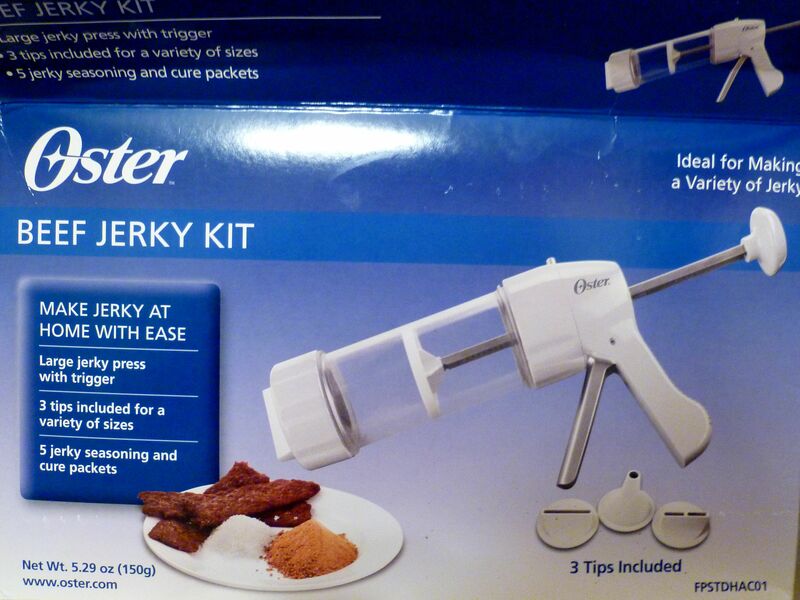 Being the only person in America without a KitchenAid stand mixer, I used my food processor for the grinding and the stuffing was done with this Oster Jerky Maker rig which worked very well (13 bucks thank you Bill!). This Jerky making rig did a darn good job for 13 bucks! So here we are, chilled, ground meat mixture, stuffing rig, and finished sausages. Since I’m only two-handed, you’ll have to take my word for the fact that I really did stuff these babies myself. Working alone, it was all I could manage to handle the sausage, let alone the camera. Altogether, it wasn’t the Lucy and Ethel event I was dreading. I was actually somewhat competent and organized. 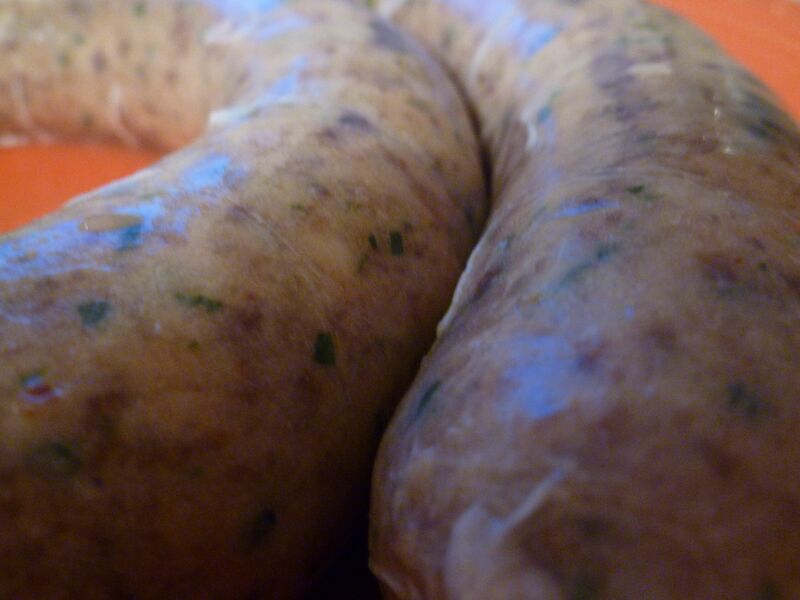 This sausage is rich and the pecorino makes it a bit salty. You would never know the raisins were hiding in there unless I told you. 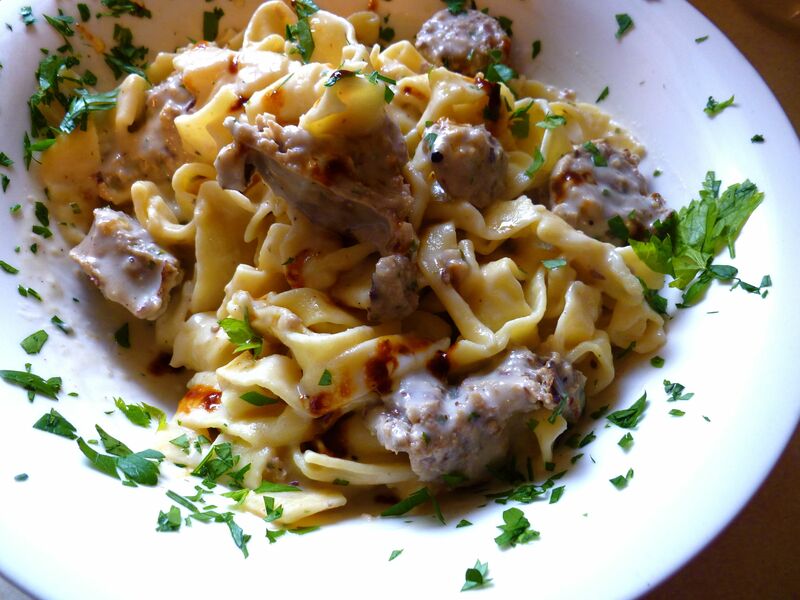 I thought it best to let the sausage dominate, and decided to support it with a classic white sauce. Served over homemade pasta, again thanks to my cousin who makes a beautiful noodle, I’m feeling very satisfied. Bring on that frankfurter challenge – I’m ready! One of my favorite things about sausage is the thick, dark, carmelized drippings left in the pan after you fry the meat. I like to drizzle that over top of my sauce to further richen up the flavor. Great post! My husband grew up in Altoona, PA and has seen his fair share of wild / suburban turkeys… Your sausage sounds delicious (although too bad about the crushed red pepper), and I want a bowl of that pasta!